Last year my son’s school decided to use some of their sport’s premium money to pay for someone to come in and run a session with all the kids on meditation and mindfulness. It may seem like a slightly strange way to use money designated for “sports” but mental wellbeing is just as vital as physical wellbeing and luckily his school recognises and supports that. The school used the session to also up-skill teachers so that they could continue this mental wellbeing work with children throughout the rest of the school year, and I’m so glad they did. My son (who is now six and in Year 1) has a regular meditation session at school. Just five or ten minutes, but when I ask him about his school day he often tells me that it’s one of his favourite parts. He’s very much a boy who likes to be active, so when I first heard this I have to a admit that I was a bit surprised. I personally struggle with meditation and mindfulness as I’ve always found my mind wandering and myself wondering what else I could be doing with that period of time to tick things off my to do list. It may well be that I’m just not doing it right, but I realise how helpful so many other people find it, so I’m glad my whirlwind of a son has found a way to meditate that works for him. Lisa Roberts’ book, Teach Your Child Meditation, has the subtitle 70 fun and easy ways to help kids de-stress and chill out, and I think that sub-title really explains what we all need to help our kids do. Kids seem to feel stress and pressure in our busy lives in a way that I’m not sure we did when we were their age. My eight year old daughter sometimes speaks about feeling stressed, and I find it a bit sad that children are feeling something that previously was always considered an adult thing. There are times when I want to help her calm down and centre herself again after an angry outburst about something. making it easy to jump in and find something that you want to try with your child depending on their circumstances and emotions. There’s also a fantastic “Getting Started” section which presents an overview of what you’re going to cover in the book, along with some general tips and techniques for working through it with children. It’s a brilliant introduction, especially if you don’t meditate yourself. Each of the exercises is presented really clearly, with a box entitled “simple steps for kids” which you can work through with children. The steps explain everything in plain language, in a way that children can understand and without any confusion. The amusing titles for each of the exercises help to capture children’s imaginations and help them see meditation as a fun thing to do. I can see Teach Your Child Meditation as becoming a bit of a family bible for when the kids need a bit of help to either calm down, de-stress, or just coming to terms with their emotions. The exercises are quite different to what my son has being doing at school (in his words they get told to “imagine” they are things a lot there) but the basic principles are the same. I’ve flagged quite a few exercises in the book as ones that I think will help at different points in family life and I’m keeping the book so it’s to hand for being able to quickly pick it up and get going with an exercise when one is needed. It certainly gives me a great array of new tools in my parenting toolkit! 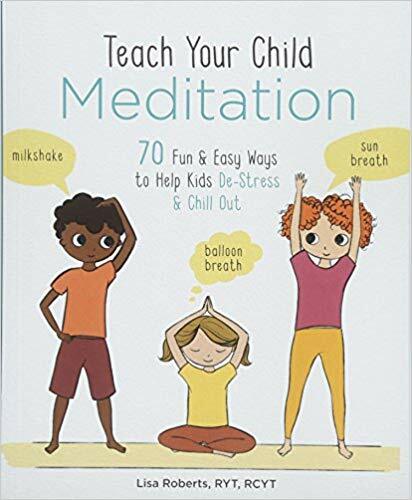 Teach Your Child Meditation, 70 fun & easy ways to help kids de-stress and chill out by Lisa Roberts was published by Sterling in October 2018. RRP £14.99. Paperback ISBN 9781454929185. Available to buy online here (just ignore the bit where Amazon says it comes with a CD – it doesn’t!). Disclaimer: We were sent a copy of Teach Your Child Meditation for the purposes of this review. All opinions remain my own. This post contains affiliate links.